Please join us for an incredible evening to celebrate IPM’s life-changing work across borders of culture, faith, and economic circumstance with children, women, and youth nurturing justice, peace, & hope in our world. Tickets include eclectic food, music, dancing, handcrafted cocktails, & a fabulous silent auction. 5:30 PM ~ VIP Patron Reception with IPM’s Project Partners from around the world. EXPERIENCE . 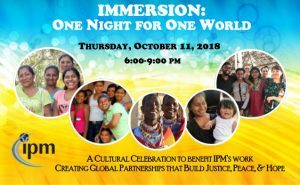 . . ONE NIGHT FOR ONE WORLD Meet IPM’s Project Partners from more than 10 countries including Brazil, Colombia, the Dominican Republic, El Salvador, India, Kenya, Nepal, Nicaragua, Uganda, & the U.S.A. Discover our unique Immersion Experience travel opportunities. Partner to bring justice, peace, and hope to children, women, and youth in our world.